Naoshima is the most famous island of the Setouchi Triennale. While some might argue that Shodoshima is more famous, especially in Japan, when it comes to art, Naoshima is more well-known. The Benesse project is also well known although how you define well known is another question altogether. Benesse is originally a language and communication training company. Their most famous subsidiary is the Berlitz Language School. It is a bit ironic that I was visiting these sites yet I am working for one of the competitors to Berlitz. 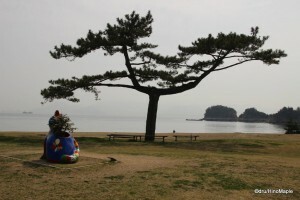 Benesse can easily be credited with starting the Setouchi Triennale by planting the seeds that it did on Naoshima. They started in 1989 as a project to bring more awareness to Naoshima and the Seto Inland Sea and to hopefully reform and grow the islands. It has taken over 20 years and Naoshima continues to grow, albeit at a slower pace than before. 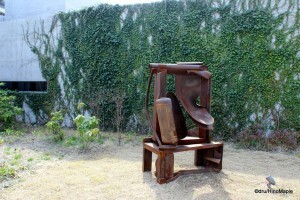 The Benesse Art Site can be grouped into two regions, the Benesse House area and the Honmura area. While the Honmura area is an important area for the Benesse Art Site, it isn’t part of the private property of Benesse, so I will discuss it in a future post. The Benesse House area is located at the far end of the island, if you are taking the bus. The most distant location is the Chichu Art Museum. Do note that you can cut across the island from the main port, Miyanoura, on foot or by bicycle to save money at the expense of your own energy. The Chichu Museum is the most touted museum on the island, from the opinion of my friends. It also happens to be the most expensive costing 2000 yen per visit. The architecture was designed by Tadao Ando, a world-renown architect who designed most of the new structures on Naoshima. He created the Chichu Art Museum with the idea that it is one with nature, so the entire museum is underground. You have to start by heading to the parking lot where you can purchase tickets. After you purchase tickets, you walk up the road where you can enjoy the first part of the museum, an outdoor garden. Apparently it is supposed to conjure images that Monet wanted to capture in his own paintings. The museum itself is nearly a labyrinth causing me to get completely lost looking for things. Tadao Ando is a genius when it comes to simplistic designs using concrete but I’m not sure I’m such a fan of using so much concrete. The first main artwork I experienced was Walter De Maria’s “Time/Timeless/No Time”. It was a large room with a polished stone ball in the middle. I can’t explain it well but you can see it on their website. It was a nice work to see but difficult to find. It was in the lowest basement and hard to enjoy with dozens of other people there. 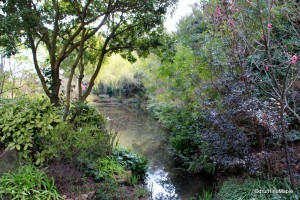 I then headed to the Monet exhibit and had a bit of time to look at several of his paintings. I was more impressed by the floor which was made up of 1X1cm tiles that were all placed by hand. Finally I visited the James Turrell exhibit which comprises of 3 works, “Open Sky”, “Afrum, Pale Blue”, and “Open Field”. Open Sky is basically a square room with a skylight. At night they change the colours but in the daytime it felt like a regular waiting room, and it was a waiting room as I had to wait there, in line, to get to Open Field. Open Field was one of the best works that involves walking up steps into a white room that has blue lights projected all around it. It is like walking into a spaceship that is all blue and not knowing where the end is. The only way to know you are at the end is when the alarm sounds and the workers tell you to back off. It did ruin the mood a little but I did enjoy the artwork. Afrum, Pale Blue was a simple projection in a busy room, so it was not the best work in my opinion. I also had a chance to visit the café located in Chichu Art Museum and it was a nice place to visit as the views of the sea and Takamatsu in the distance were really nice. I only wish the prices were more reasonable. The Lee Ulfan Museum is the newest museum on Naoshima. 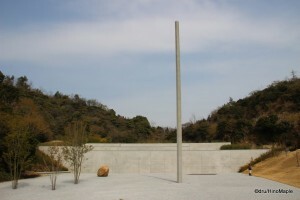 It was also by Tadao Ando, with the use of a lot of concrete, and also based underground, akin to the Chichu Art Museum. Unlike the Chichu Art Museum, the Lee Ulfan Museum was designed in collaboration with Lee Ulfan himself so that the artwork would be displayed in a way that the author wanted. All of the artworks were created by Lee Ulfan whose works are predominantly revolving around rocks, dark steel sheets, and gradient blotches of colour. It can be a little difficult to explain but when you see the exterior of the museum, you get a taste for the artworks inside. The museum itself was more architecturally interesting to me as it was a small museum and a natural flow from one corner to the next, unlike the Chichu Art Museum. The entrance to the museum has several artworks. As you enter, you have to pass through “Relatum-Point, Line, Plane”, which is a large field of stones with three major works in it, a large stone, a concrete pole, and an iron plate. You then walk into the museum where you see “Relatum-A Signal”, which is almost the same as Relatum-Point, Line, Plane, except there is no concrete pole. The first main room you enter has a lot of Lee Ulfan’s work to show you how his work has progressed over the years. You then enter the “Silence Room”, which is a darkened room with an iron plate and stone. The “Shadow Room” is next with just a stone in a darkened room, but a shadow is cast and scenes of nature are projected onto the shadow. It was an interesting use of technology to create art. The last room was the “Meditation Room” which was just a few wall paintings done by Lee Ulfan and you are supposed to meditate and become one with the art. In fact, you are supposed to become one with the art in all of the rooms by meditating. I thought it was a nice simple museum but I’m not sure it is worth the 1000 yen regular admission price. Outside, in the main yard in front of the museum you can also see “Relatum-Dialogue” which looks similar to a piece of nori (seaweed) placed between 2 rocks, as well as “Relatum-Repose” which is simply an iron bar on top of a rock. I am purposefully using simple words to explain the art as it is very simple. While the composition was interesting, I don’t know how much time is really needed to make each piece, and understanding the author’s message was impossible for me. I did enjoy it a bit more than the Chichu Museum, but it could have been because it wasn’t very busy. The Benesse House is the last art museum to visit on Naoshima. Unlike the Chichu and Lee Ulfan museums, the Benesse House has changing exhibits, along with a few permanent exhibits. I had already visited Benesse House in the past and found it less inspiring. This time they had a Yasuo Kuniyoshi exhibit. I didn’t enjoy his artworks, to be honest, but I just don’t like that style. I know many other people would like it but I didn’t. Also, I had already seen the other permanent exhibits so I didn’t feel a need to spend much time inside the museum. I was more interested in the outdoor exhibits. I had a lot of fun with them the last time I was there, but since I was on Naoshima on a Sunday during the Setouchi Triennale, it was really busy. I did have fun with the artworks because they lend themselves to be climbed on and played with. Some artworks are closed but generally they can all be enjoyed. There is a special map available from the various information centres at the Benesse House Museum and it can help you find everything easily. Within the Setouchi Triennale, “Final Call” by Anthony Caro was the only new artwork, and this was a pity. I found it to be uninspiring as it looked like a big hunk of rusted metal that was made of smaller pieces that were welded together. There was also a tour that I didn’t take part in as it required more money to see and I just wasn’t up for it. The Benesse House area is an area you have to see if you are visiting Naoshima for the first time. While I don’t think the price of admission into all of the museums is worth it, if you are going during the Setouchi Triennale, the discounts make it worth it. Just be ready for the lines. I spent about 1 hour or more waiting in line to get through the Chichu Art Museum. For the outdoor exhibits, you have to wait your turn to get good pictures with the art and even then it can be difficult. I highly recommend going to Naoshima on a weekday, and I was planning to do so but I couldn’t as they were closed on Mondays. I don’t regret going to Naoshima for a second time and there were a few things I wish I could have done, but the chance to see the Lee Ulfan Museum as well as a few other artworks that I missed the first time I was on the island was a good reason to revisit Naoshima. I was also happy that I had good weather so I could enjoy taking photos when I was allowed, rather than the grey weather I experienced the first time I visited Naoshima. Naoshima (Benesse Art Site) is part of a series of posts on the Setouchi Triennale. Follow the links below to read more about the different aspects of the Setouchi Triennale. 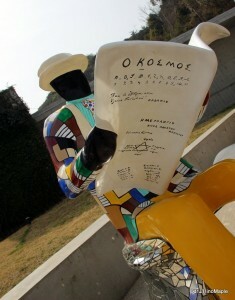 Naoshima (Benesse Art Site) is also part of a series on Naoshima. Follow the links below to read more. This entry was posted in Setouchi Triennale, Shikoku and tagged art, Benesse, Benesse Art, Benesse Art House, Benesse Art Site, Benesse House, Benesse Museum, Chichu Art Museum, Chichu Museum, japan, Kagawa, Lee Ulfan, Lee Ulfan Art Museum, Lee Ulfan Museum, Naoshima, Naoshima Art Site, Setouchi, Setouchi Art Festival, Setouchi Triennale, Takamatsu by Dru. Bookmark the permalink. To the surprise of many, I’m much less interested in Naoshima than any of the other islands. Too touristy, too crowded (although I got lucky the last time I went, it was the last day of the Spring session of the Triennale and it was not that crowded, no real waiting line anywhere), too “artificial” in a sense. However, I do love the Chichu Art Museum and the outdoors art. Not a big fan of Benesse House and Lee Ufan though. To the surprise of many, but not to the surprise of me. 🙂 I agree, Naoshima is too crowded, but I don’t really find it too touristy. It didn’t hold up compared to the other islands. I guess we can’t agree on Lee Ulfan and Chichu. If I went when it wasn’t as busy, in other words, not waiting at least 10 minutes for each artwork, I may have enjoyed it a lot more. Also, I had Lee Ulfan’s museum almost all to myself. I had to wait a little in a couple exhibits, but I had the chance to enjoy it completely alone (aside from my friend who was with me) so that may make a difference. I’d like to visit Naoshima just to see Ando’s design, though. This year, I would visit Naoshima for the Hiroshi Sambuichi exhibit. Worth a visit before going to Inujima if you can. Very enlightening and will be discussed next week. Yes, Hiroshi Sambuichi’s exhibit is probably one of my favorite thing on Naoshima right now, and I can’t wait to see what he’s going to do on Naoshima (and when I’m a millionaire – in $$ or € not in Yen 😉 ) I want him to design my house. I’ve just Googled images of Hiroshi Sambuichi’s designs. I’m in love. PS: You get better results if you Google him in Japanese. So … he’s not that well-known outside Japan yet?